I’m going to knock two books off my Classics’s Club List in this post. They’re both written by James Fenimore Cooper (best known for The Last of the Mohicans) and both take place on and near the sea, so grouping them together makes sense. In fact, the library book I read has both in a single volume. The Red Rover (1827) is a re-read for me, but The Pilot (1824) was new. I really wanted to like these books. They’re the sort of stories that I usually love. But I just wasn’t really liking them and found myself skimming large chunks. It wasn’t until halfway through The Red Rover (which I read second) that I finally figured out why. My favorite books are usually character-driven, but Cooper isn’t really writing to tell his characters’ stories. He’s writing love-letters to the sea and the men who sail her waves. At first, I felt compelled to prove him wrong. I like books about vessels and the ocean. And the story’s plot centers around two young American naval officers (Griffin and Barnstable) who risk their real mission in trying to rescue the women they love. There’s also a mysterious Pilot, who has an equally mysterious connection with another woman at the house. It’s a perfect recipe for a romantic adventure. But Cooper doesn’t take full advantage of the compelling plot he’s crafted. Oh, he keeps with that story line but the characterization starts falling apart. Cooper will spend several chapters describing in loving, minute detail how a ship’s crew navigates away from a particularly dangerous piece of coastline during a storm. But if you’re expecting such care taken with the characters you’re in for a disappointment. I was particularly disappointed by his female characters. Cooper is even more patronizing toward them and has as little faith in their constancy as the male characters do. It’s quite aggravating. Almost as aggravating as keeping readers in suspense regarding the Pilot’s identity for the entire 422-page book and then never actually revealing his name (he’s John Paul Jones, which I knew by page 146, but it’s never explicitly confirmed). The Red Rover is a tighter story that The Pilot. There are fewer scenes that side-track from the main plot (though they are still quite numerous), the character relationships are explored in a bit more depth, and the mysteries surrounding these characters unfold naturally rather than for pointless drama (until right at the end, which it’s suddenly revealed every major character is related in some way). But it is still, first and foremost, a book about being on the sea more than the characters who sail the waves. And the plots often feel contrived, sloppily stuck together as an excuse to write about the sea and sailors. When Cooper was 17 years old, he joined the crew of a merchant ship as a common sailor. 11 months later he joined the U.S. Navy as midshipman. He never rose to a higher rank, never sailed on salt water, and only served for 2 years and 5 months. But it still left a profound impression on his writings. He also befriended a man named William Shubrick whose naval career lasted 55 years and who was no doubt a great source of information. Copper dedicated both books I read to Shubrick. You can’t fault Cooper for his depictions of sailing and sailors. He excels at describing the set of sails on a ship’s masts or a maneuver at sea. And when he digresses from the main plot, it’s usually in scenes staring sailors (which I think were often meant to be humorous). But it still drove me crazy how many times he pulled back from important character scenes. Cooper skips a week in The Red Rover that I desperately wanted to read. How can you not write the scenes where two shipwrecked women are taken on board a pirate ship and made to believe it’s a ship in the English Navy!? Or the scene where a pirate’s Lieutenant, who was supposed to lead the ship with said women on board to the pirates as a prize, has to explain why he tried so hard to keep away from them that his ship was destroyed? The character moments that we do get mostly come from the leading men — the Pilot, Griffith, and Barnstable in The Pilot and Wilder and the Rover in The Red Rover. But these moments seem less about character development and more about using the characters as mouthpieces for patriotic sentiment. The Pilot is set during the Revolutionary War, so the characters have plenty of opportunity to argue in favor of American independence. And while The Red Rover takes place during a time when America was still thoroughly English, one proof of the Rover being a visionary leader is that he sees America’s potential once freed from Britain (see quote in the picture above). 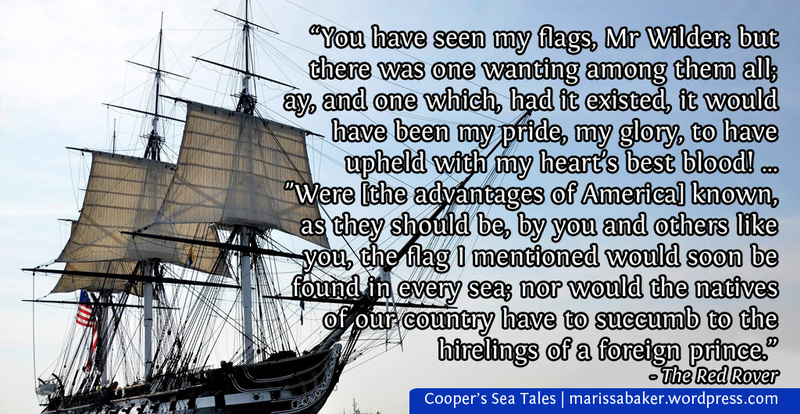 This is patriotic emphasis scarcely surprising, considering Cooper was an American writing less than 50 years after the American Revolution. But I would have still liked the characters to feel more real. We don’t get inside the characters’ heads and they’re all keeping secrets from us. I just felt too distant from the characters and too irritated by the contrived nature of the plots to really enjoy the books. Click here to get a copy of The Pilot and Red Rover . Please note that this is an affiliate link. This means that, at no additional cost to you, I will receive a commission if you click on the link and make a purchase.